Reno is full of family entertainment to choose from, but not all places are created equal. Some places provide physical activity but lack challenge. Others have a challenge but can get boring. Others are interesting but don’t get the blood pumping. Need 2 Speed, on the other hand, is interesting, gets the adrenaline pumping, and creates a challenge for all ages. But if that’s not convincing you that N2S is the place to be for some awesome family entertainment, then we can spell it out for you. Spending time with the family is almost always a good time, but Need 2 Speed gives you the chance to spice things up. The feeling you get when you sit down behind the wheel is pretty awesome, and hitting those curves trying to get ahead of your competitors on the track gets the blood pumping and puts a smile on your face. Even kids who are too young to actually drive cars can get a small taste of what it’s like to be a race car driver. Be careful though, you all might get addicted to that rush of adrenaline you get! While some activities in Reno are pretty fun, they can also be risky, especially for the younger kids. However, at Need 2 Speed, we take safety as seriously as we take having fun. We make sure everyone is securely belted into our karts, helmets fit just right, and that all of our races are age- and speed-appropriate. Our awesome trained staff make sure that all ages are driving safely on the track. We keep an eye on our mini-golf course to make sure teams are evenly spread out and the game is being played properly. We promise that through it all, your family is bound to have a super-fun time. With race karts for kids and adults, an indoor mini golf course, and virtual reality experiences, you’ll probably experience something new everytime you walk through our doors. Our blacklight golf course gives you a cosmic experience that you’ve never had before while testing your skills on a challenging course fit for any age. 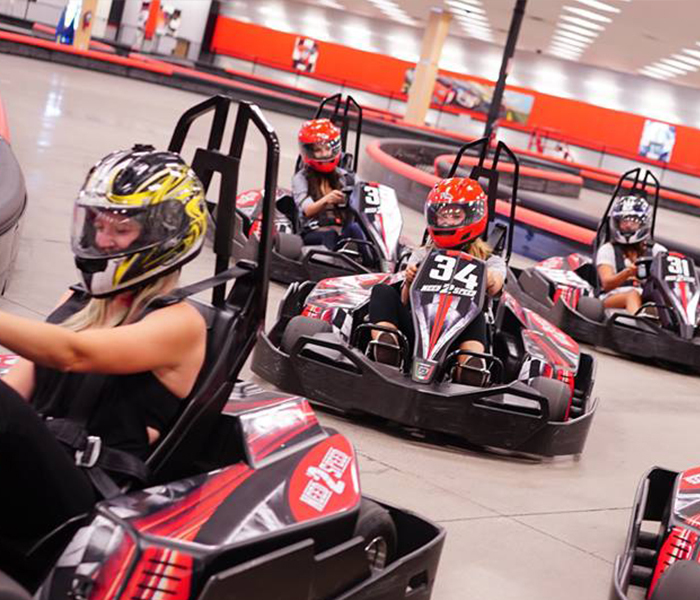 Our indoor kart racing gives you the competition and speed you didn’t even know you craved. Our virtual reality roller coaster gives you an adrenaline rush and speed that is different every single time. Whatever experience you want, we have it. While there are many choices to choose from when it comes to family entertainment in Reno, none of them compare to the one-of-a-kind addicting experiences that you’ll get at Need 2 Speed. Now all you have to do is get on in here, and the fun will find you!